Volt is Nordic Culture Point’s new culture and language program for children and young people. The goal of the programme is to encourage Nordic meetings through culture. It also aims to create an understanding of languages in the Nordics where young peoples’ own cultural and artistic creativity and participation takes the centre stage. Participation is one of the key features of Volt, which not only encourages young people to participate in the activities themselves, but to engage on all levels. 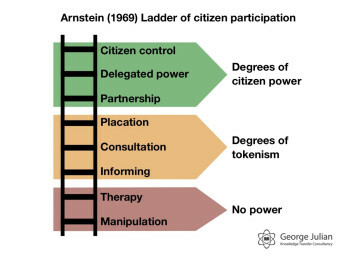 The researcher Sherry Arnstein has developed a model for participation with eight steps – from manipulation to citizen control – and Volt spurs those projects with aim to take as many steps as possible. A few concrete tips on how get the opinions of young people heard during the project process are as follows. Anchor the project to youth organisations, visit schools or other places where you may meet the target audience. You could also host a workshop where young people can express their thoughts. Why not use the student government body as a resource? The best way to access the opinions of young people is to use pedagogic methods for coaching the youth to run the project themselves, with the aid of democratic models. One example of this is Volt’s group of experts (who assess the project ideas before they are granted), where half of the members must be under the age of 25. The other key features of Volt include the cooperation aspect, the Nordic aspect and the aspect of language. Here the exchange between Nordic children and young people are in focus. Volt aims to contribute to a greater interaction among the Nordic regions, where projects attempt to make young people more curious about the Nordic diversity of languages. Volt’s first application round received 34 project proposals. Here the group of experts could see a glimmer of how these features might be made into reality. There were projects involving camp activities and online interaction among the young participants, projects involving dance, theatre, music as a cultural and language marker – and many more. Do you have a project idea that could fit within the framework of Volt? Get in touch today and think about how an application can be anchored amongst the young. We in the expert group look forward to seeing your ideas during next year’s application round. TEXT: Rebecca Mattson, chairman of the expert group for the support programme of Volt. Contact the advisers at Nordic Culture Point for questions and feedback regarding your options for receiving a grant.